Hotel stays whether for work or pleasure are the best. You can throw your towels on the ground, your bed is made, and you can eat room service in bed while you watch ridiculously priced movies. Starting this summer, Marriott hotels is making it even easier for guests to veg out (and a little more affordable) with the introduction of Netflix in their rooms. 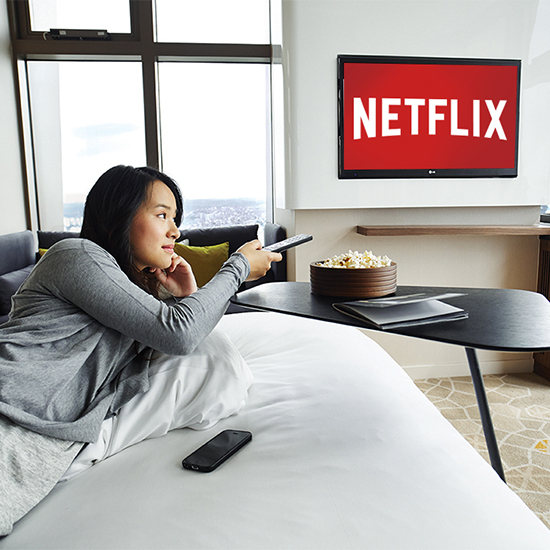 Starting this summer, guests can stream Netflix on in-room screens via a hotel TV-enabled app. Guests can sign in to already existing accounts or sign up for Netflix straight from the remote. The cheapest plans start at $7.99 for unlimited streaming: the same price as signing up for Netflix on your own, but it's smarter than paying the cost of a single in-room movie. Currently, only six Marriott properties (New York Marriott East Side, San Jose, Princeton, Newport, DFW Solana and Bethesda) offer the new feature, but 100 more will have Netflix by the end of 2015, and another 300 will by the end of 2016. Much like the rooms, Marriott is guaranteeing that user streaming accounts will be refreshed and cleared between guests, so your binge-watching habits are safe and sound.